At WWDC, Apple announced the iOS 11 and beta is already available to download. In the Previous article, I wrote how to download and install iOS 11 beta on iPhone or iPad. If you want to try the iOS 11 beta, you can download and start using it. While browsing the new features, I found an excellent “Dark Mode“ in iOS 11. It works fine with most of the apps and you will love using your phone in this dark mode at night. 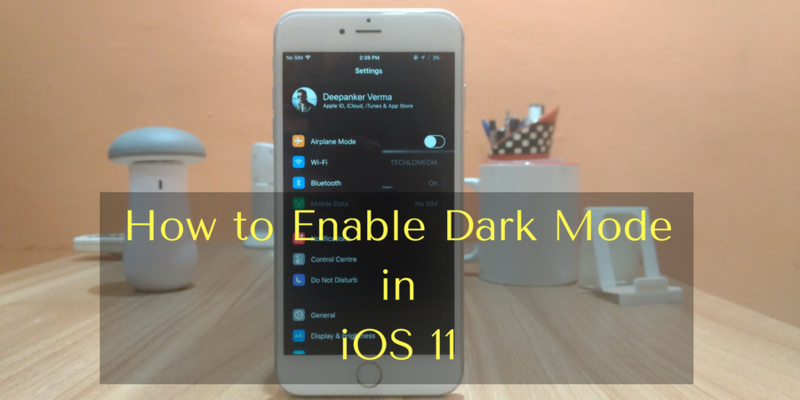 In this article, I will show you how to enable the dark mode in iOS 11. Apple does not call this dark mode. It has listed this feature as “Smart Invert.” I am not sure if you know, Apple already added “Invert Colors” option that simply reverses the colors of the display. Now Apple has added another option “Smart Invert” that smartly reverses the colors and ignores media files and images. So, you will have an awesome experience of dark mode with the “Smart Invert” option. Step 1: Open the Settings app on your iOS device and tap on General. Step 2: Now tap on Accessibility and then tap on Display Accommodations. Step 3: Here you see Invert Colors option tap on it. Step 4: Now you see Smart Invert and Classic Invert options. The Classic Invert is the older Invert Colors option. For experiencing the dark mode, you need to toggle the switch next to Smart Invert. You have successfully enabled the dark mode on your iOS device. Now you can watch videos, browse the web and do other things. You will surely enjoy this dark mode in the night. Few apps may not support this, but most of the apps will work fine. If you want to disable this dark mode, you need to follow the same steps and turn off the switch next to Smart Invert. Smart Inverts is a nice option and allows you to try the Dark Mode on iOS 11. If you have installed the iOS 11 beta on your phone, do not forget to experience the Dark Mode. What do you think about this new feature? Share your views with us in comments.